Paris has long been at the forefront of fashion, and France's stylish capital is famed worldwide for its multitude of exciting designers. What better way to spend a day during your trip to the capital of Couture than a Fashion Show at Galeries Lafayette! 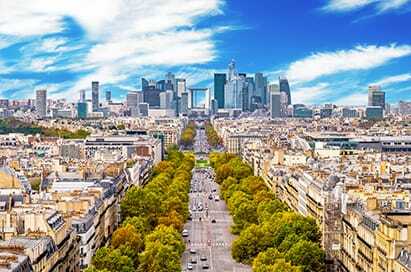 Guided Fashion Tours are also available to show you the fashion houses that Paris is famous for. Sightseeing cruise on River Seine. Return Eurostar to UK and onward rail travel. An ever-changing display of Yves Saint Laurent’s work will present the Foundation’s rich and unique heritage. Approximately fifty models will be exhibited, along with various accessories, sketches, photographs, and videos. The salons where the collections were shown and the historic studio where the couturier worked will offer visitors a glimpse of his creative process. 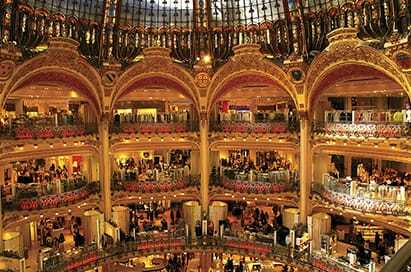 Galeries Lafayette has a weekly show, every Friday at 3pm throught the year. This 30 minute show is a great opportunity to see the latest trends, direct from the catwalks of one of the world's most fashionable destinations. Paris really is the home of couture! Visit a fashion designer located in the heart of Paris and learn about the fashion design industry in France: an exclusive visit led by an experienced guide from the world of fashion. This museum houses a fantastic array of couture dating from the 17th Century to the 20th Century. It was moved as part of the Grand Louvre project to a much bigger building. One of the world’s premier fashion and textile show, this has been running since 1973. The exhibition occurs twice yearly once in February and then again in September. On the last day of the Exhibition the organisers make a limited number of places available to students studying a fashion or textile related course.